War is unforgiving. Threat matrices continuously undergo change. Geopolitics, economics and technology play critical roles in defining these. Therefore, armed forces across the world continuously attempt to reequip, reorganise, restructure and redefine in order to enhance their operational capabilities. The focus of these processes invariably is to build proficiency in the relevant domains for present and future conflict scenarios. With finite financial resources, there is a perpetual debate between quality and quantity. The United States Air Force is presently in this phase and is looking to expand capacity through quantity. 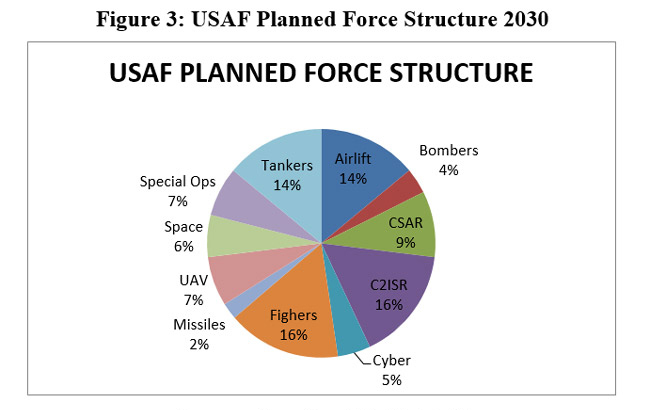 Looking at the current inventory mix of the USAF, the emphasis on fighters and airlift capabilities are apparent (Figure 1). Fighter aircraft try to achieve airspace control so that other kinetic elements can operate freely. Additionally, these aircraft provide long range accurate delivery of kinetic weapons to achieve tactical and operational objectives. The transport fleet is required to achieve a high mobility quotient for the combat forces. With a global outlook for military operations and current deployment in almost all parts of the world, the necessity for very high airlift capability is essential. Aerial refuellers (Tankers) and Command and Control, Intelligence, Surveillance and Reconnaissance (C2ISR) assets are also in substantial strength. The tanker force helps in the deployment and employment of combat power, minimising en route halts. This compresses the deployment timeline and, additionally, helps in retaining an element of surprise by allowing combat aircraft to project force far away from their operating bases. In so far as C2ISR assets are concerned, their significance is related to the ability to enhance battlespace transparency for the accurate planning and controlling of missions for safe execution. Invariably, these, along with space resources, are the first assets to be employed to gain a picture of the battlespace. 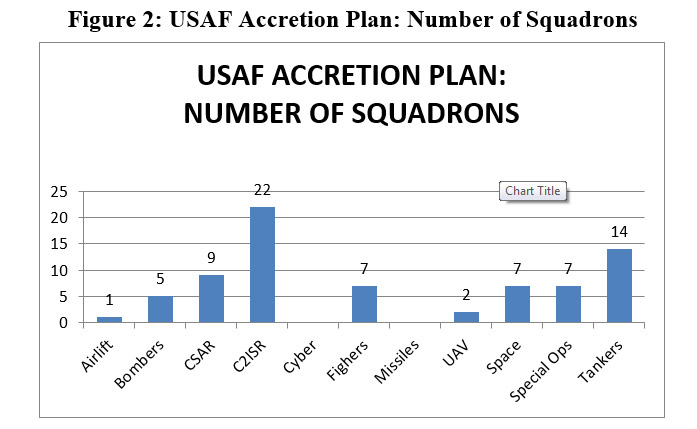 The USAF expansion plan envisages an addition of 74 squadrons. An analysis of these additional squadrons brings to fore the changing character of likely combat engagements. The two most prominent verticals being planned for expansion are C2ISR platforms and aerial refuellers (tankers) (Figure 2). In addition, an additional seven squadrons for fighter combat aircraft and five squadrons for bombers are being planned. But no accretions are envisaged for the cyber and missile force; their capability enhancement would be through equipment upgradations only. And although Unmanned Aerial Vehicles (UAV) have expanded their operational role, no major expansion is planned in this field. The prime reason for such a lopsided approach in favour of manned combat aircraft is the limitations of UAVs in a hostile air defence environment. Russia and China have developed and deployed advanced air defence systems. A number of countries are in the process of acquiring high technology air defence systems from Russia and China. The proliferation of such advanced air defence systems will limit the efficacy of UAV operations. That may be a possible reason for the limited expansion envisaged for the UAV fleet in the restructuring plan. With an increase in manned combat aircraft, an increase in resources for Combat Search and Rescue (CSAR) is an obvious fallout. Consequently, the plan envisages an additional nine squadrons for CSAR. 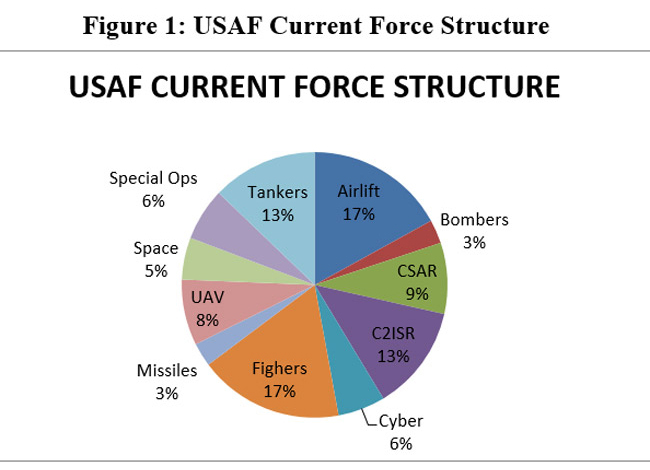 Once the proposed accretions fructify, the USAF force structure will, for the first time, have an equal numbers of squadrons for C2ISR and fighter aircraft (Figure 3). In the heavy aircraft category also, parity will be achieved between tankers and airlift aircraft for the first time. Special operations squadrons and space units will increase their share from current levels. 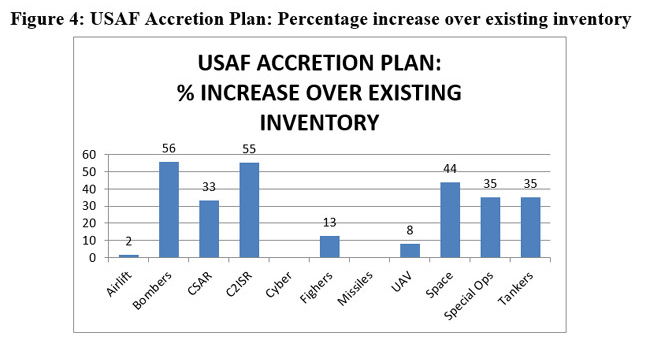 A close examination of force accretion planned over and above the existing inventory given in Figure 4 indicates that the current USAF dispensation feels an acute shortage of bombers, C2ISR and space assets for likely missions in the coming decade. The expansion plan increases their quantity by over 55 per cent. A major increase in C2ISR and space assets is indicative of an increased requirement to monitor a larger area for a longer duration and with multiple sensors. This kind of surveillance and reconnaissance has become a necessity owing to the changing character of war. Unlike during the Cold War when the focus was on major military manoeuvres with large formations as the key threats, now small teams can operate to achieve critical objectives with strategic implications. This calls for greater monitoring of the area of interest. Hence an increase in C2ISR and Space assets is an obvious assessment. An added implication of this changing character of war is on special operations. Gradually, their relevance in kinetic operations has increased and these operations are becoming the first option for planners. In certain situations, special operations help achieve the objectives without large-scale force-on-force engagement. With hybridisation of war, the salience of special operations will only increase. It is probably this assessment that has led the USAF to project a 35 per cent increase in the number of special operations squadrons. As the majority of aerial platforms of the USAF are capable of aerial refuelling, an increase in receivers would entail a corresponding increase in tankers. To retain the existing Tanker-Receiver ratio, the tanker force is to enjoy a 35 per cent accretion in numbers. For one of the largest air forces in the world to ambitiously expand by nearly 25 per cent seems contrary to the long-term trend. 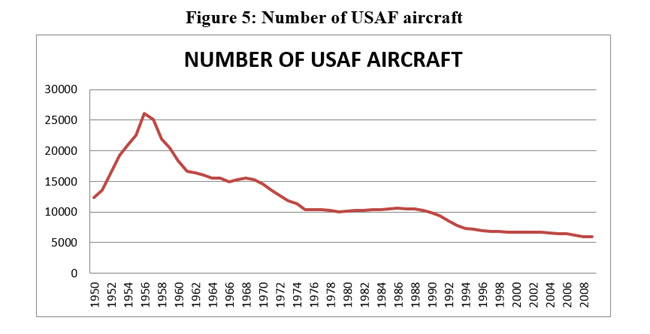 Notwithstanding a number of new facets like cyber, space and missiles added to the arsenal of the USAF, its number of aircraft has been declining steadily for decades since the peak strength of 26,104 aircraft in 1956 (Figure 5). The USAF aircraft inventory has shrunk by over 80 per cent during the last 60 years. To fulfil the requirements of the expansion plan, an addition of over 400 aircraft will have to take place during the next decade. This will be over and above the replacement of ageing aircraft like the F16 with the F35. It is likely that other arms of the US military organisation will have a similar wish list to expand capabilities, citing the 2018 United States National Defense Strategy. The additional demand for aviation assets from the US Army, US Navy, US Marine Corps and US Coast Guard is likely to be a matter of time. A similar 25 per cent increase by all entities over the next decade will have major implications on force levels and finances. That will be a major dampener. If the plan were to be sanctioned, it will indeed be a bonanza for the aviation industry. Once all the restructuring studies are submitted and a comprehensive USAF restructuring plan made, the project costing will be done. Based on types of aircraft and equipment planned for induction and the associated increase in manpower, the overall financial outlay for the USAF may have to increase by at least 25 per cent from current levels assuming that no quality compromises are made. That will mean an increase in the USAF’s share in the defence budget. Another factor that will play a major role in redefining the USAF’s restructuring plan is the creation of the Space Force. The new organisation will probably hive off space assets of the USAF for consolidation under one agency. Furthermore, this entity will probably have a priority for budgetary allocations and further compress the resources that could be made available to the USAF. Before treading on a restructuring path, taking the US Congress along and pacifying other contenders for the annual defence allocation will be the key battles that the USAF will have to fight and win. The outcome of these battles will define the course of the force’s restructuring. Going by the history of such ambitious expansion plans across the globe, it is safe to assume that the restructuring plan will have to be scaled down qualitatively or quantitatively. 1. Stephen Losey, “New Air Force secretary: 'We are too small for what the nation expects of us',” Air Force Times, June 6, 2017, available at https://www.airforcetimes.com/news/your-air-force/2017/06/06/new-air-force-secretary-we-are-too-small-for-what-the-nation-expects-of-us/ (accessed on September 27, 2018). 2. Lee Hudson and Jen DiMascio, “Can The U.S. Air Force Add 74 Squadrons? Aviation Week & Space Technology, September 24, 2018, available at http://aviationweek.com/defense/can-us-air-force-add-74-squadrons (accessed on September 27, 2018). 4. Ken Dalecki, “Air Force Secretary Wilson highlights plans to expand the air force at NPC luncheon,” The National Press Club, September 26, 2018, available at https://www.press.org/news-multimedia/news/air-force-secretary-wilson-hi... (accessed on September 27, 2018). 5. Chuck Broadway, “SecAF Wilson provides Air Force update,” USAF, September 17, 2018, available at https://www.af.mil/News/Article-Display/Article/1635645/secaf-wilson-provides-air-force-update/ (accessed on September 27, 2018). 6. Hudson and DiMascio, n. 2. 7. Losey, n. 1; International Institute for Strategic Studies (IISS), Military Balance 2018, London: Routledge, Chapman & Hall, p. 46. 9. Hudson and DiMascio, n. 2. 10. Secretary of the Air Force Public Affairs, USAF, The Air Force We Need: 386 operational squadrons, September 17, 2018, available at https://www.af.mil/News/Article-Display/Article/1635070/the-air-force-we-need-386-operational-squadrons/ (accessed on September 27, 2018). 14. Col. James C. Ruehrmund Jr., USAF (Ret.) and Christopher J. Bowie, ARSENAL OF AIRPOWER: USAF Aircraft Inventory 1950-2009, A Mitchell Institute Study, November 2010, available at https://higherlogicdownload.s3.amazonaws.com/AFA/6379b747-7730-4f82-9b45-a1c80d6c8fdb/UploadedImages/Mitchell%20Publications/Arsenal%20of%20Airpower.pdf (accessed on September 27, 2018).